Linden Lab has rolled out a new release candidate today with two of the most talked-about features since Windlight! That’s right, age identity age verification and the new web-based authentication method are here! Did I say most talked-about features? Maybe a better phrase would be most lambasted features. There’s a lot of talk about these new mis-features, sure, but not in favor of them. Opinions range from “they won’t work”, to “they’re not working”, to “even if they did work, they wouldn’t accomplish what LL claims they will”, to “thank god they’re not working, the damn things are security risks”. But Linden Lab is not in the habit of letting insignificant little things like the scathing criticism from their customers, the people who put the Life into Second Life , ruin their master plans. Onward, valiant policy-makers! To death and glory! It’s a good thing I’m still doped up on Windlight, or I might be really upset. Funny how the tiniest little remarks can inspire the most interesting ideas. I was chatting with Chrysocolla Rau in SL yesterday, and the conversation turned to the topic of tentacles, as conversations with me are wont to do. Chrysocolla (perhaps prompted by my last name, Antonelli) mused that the Italian word for ‘tentacle’ is probably quite wonderful. Despite my name, I am neither Italian nor fluent in the language, so I looked up the translation: tentacolo (pl. tentacoli). One tiny mental connection later, the concept of “Tentacolor” was born! I worked feverishly lazily into the night to produce something to show this remarkable Tentacolor. 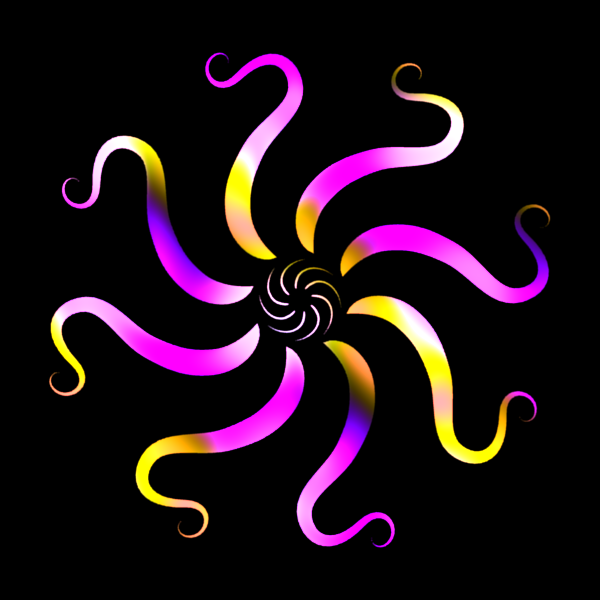 The image above is one frame out of a psychodelic, hypnotic, tentacolored animation. When finished, I’ll put the movie up on YouTube or similar, for the enjoyment of all! What: Meet-and-greets for people interested in learning about or participating in the content creators’ play group. Who: Anyone interested in learning about or participating in the content creators’ play group. Why: To mingle and get to know interested people; and to discuss plans, goals, meeting times, and other details about how this crazy thing is gonna work! I’ll be hanging around for about an hour starting at the 4 times listed above. If you’re interested in attending but can’t make it to any of those times, please IM me in-world with a time that would work better for you, and I’ll see what I can do. Tonight, I went to the Oldbie Blitz Build event at NCI Kuula! I didn’t have any plans, but one of my former students (and now a very talented NCI instructor in his own right), Locke, made an announcement in group chat, and I just happened to see it! The theme was “Space”. We had 40 minutes to build something using 40 prims or less—so, quite a different scale than the rules I’m used to from Building Shelter, 10 minutes and 25 prims. I had a ton of fun building! A couple days ago, I had noticed that I hadn’t done much building for fun as of late, so this was a great opportunity to dust off the ol’ torus-twisting finger. Here are the entries after the 40 minutes were up. Can you guess which one is mine? If you said, “That twisty, colorful one in the corner, of course!”, you’re right! It’s a fun and relaxing build to look at, especially with the sun set to midnight (World -> Force Sun -> Midnight)! 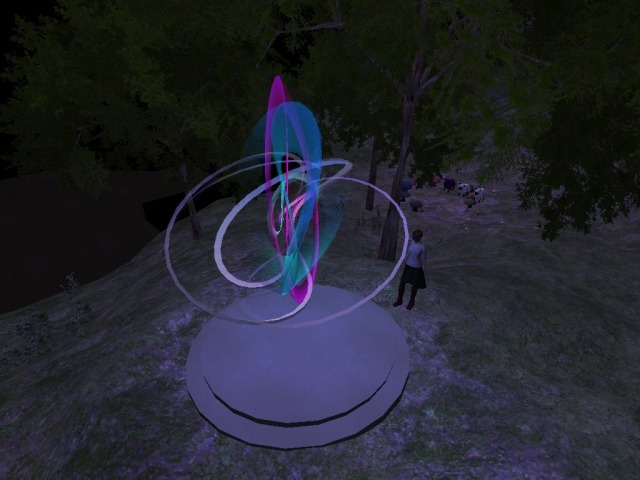 Several slowly-spinning swirly shapes to stare at, plus lovely luminous light-prims to lure you in! It’s called, “The Colour Out of Space”, after the short story by H.P. Lovecraft. Thankfully, unlike the titular essence of the story, my build won’t slowly consume the lifeforce of everything nearby! Want to see it for yourself? Please drop by my garden in Hallasan and take a gander! Bind the rotation channel of an object to a sinusoidal wave function for smooth, client-side swinging/rocking motion. A rocking chair for granny. A weeble that wobbles but never falls down. A chintzy Felix the Cat clock with pendulum tail and moving eyes. A Gothic church bell that swings convincingly. A tree branch that seems to move in the breeze. A boat that seems to gently rock and sway in the water. A bird that flaps its wings convincingly. A prim that “breathes” in and out (slowly grows/shrinks). A prim that moves in a circle, ellipse, figure-8, etc. A torus that pulses and grows over time. A carousel that goes ’round and ’round, while the horsies go up and down. A flexi clump of seaweed that waves side-to-side hypnotically. A glowstick that smoothly changes color in time to music. A flower bud that slowly opens and becomes vivdly colored to greet the sun. Motion is client-side only; collision detection won’t work in the expected way. This is already the case with rotation set on a nonphysical object using llTargetOmega. Server-side bindings could exist in the future. They would be updated relatively infrequently (only a few times per second), while client-side interpolation keeps it looking smooth. This interface is future-proof: new attributes, algorithms, and parameters could be added later, without breaking existing content. Note that multiple parameter sets can be chained together for one function call, similar to llSetPrimParameters or llParticleSystem. SIN_WAVE: Sinusoidal wave. Parameters: duration, amplitude, value offset, period, phase shift. TRI_WAVE: Triangle wave. Parameters: ibid. SAW_WAVE: Sawtooth wave. Parameters: ibid. Regarding “duration” parameter: Motion stops after this many seconds. Can be non-integer (float). Can be FOREVER (-1.0). Can be STOP_NOW (0.0). Parameters are sent to the client with the time that it started. This allows all viewers to remain in sync, even viewers who arrive after it has started. All algorithms are parametric (based on real-time); the algorithm can be evaluated at any point in time, without needing to evaluate earlier points in time to ‘catch up’. A one-time synchronization between the sim clock and the client clock would be necessary to properly know how much to adjust the current time when evaluating the algorithms. Hamlet Au of New World Notes has posted an interview with Daniel Linden regarding Linden Lab’s recently announced policy of censorship; I blogged about that announcement yesterday, as did a great many other concerned Residents. 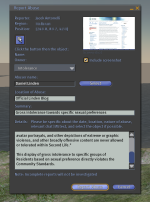 The Community actively defines what is and is not acceptable in Second Life by providing feedback to Linden Lab via Abuse Reports, blog commentary, forum discussion, and other communication channels. 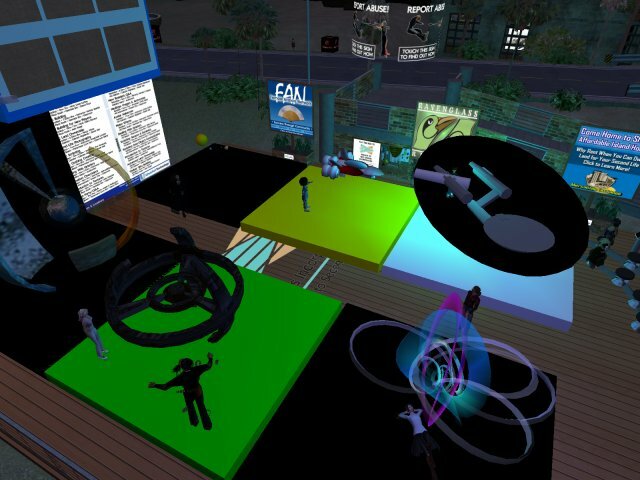 Linden Lab sets standards and acts in-world according to the expressed wishes of the Residents. If Linden Lab bases its policy on the feedback of Residents, then we need to make it perfectly clear that this intolerant policy is offensive to us, as free citizens of the world and the Grid. In order to “express my wishes” as a Resident, I have filed an Abuse Report against Daniel Linden for his display of gross intolerance against specific groups based on sexual preference—a display which runs directly against the Community Standards’ tenet against intolerance. If you care about this issue too, report Daniel Linden’s flagrant violation of the Community Standards and let Linden Lab know that you consider this gross intolerance to be an offensive behavior! Linden Lab’s latest move into the realm of censorship violates and contradicts their own Community Standards in both word and spirit. Read on, after the fold. I hope weather is next! I wants to build snow chibis in SL while flurries fall down on my head. Please don’t rain* on my parade, Linden Lab! In case you haven’t heard the news, the beta grid has the sculpty prim preview! I wooshed over there to try it out for myself! 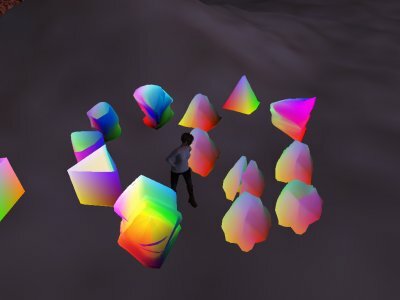 An hour and a half later, I had made 30 sculpt prims from 30 different hand-painted textures! I used GIMP’s channel mode to let me color the brightness of the red, green, and blue channels individually. Here are some of my lovelies, with the sculpt texture applied for the normal texture for your colorful viewing pleasures!